When it comes to painting as a traditional discipline, one might think most likely of still life, thick oil layers, watercolor or acrylic on canvas. At first glance, the colorful construction art pieces of Eva Berendes might not evoke the features of classical paintings. Though her objects can conceptually be considered as such – as paintings which are liberated from their static two-dimensionality. 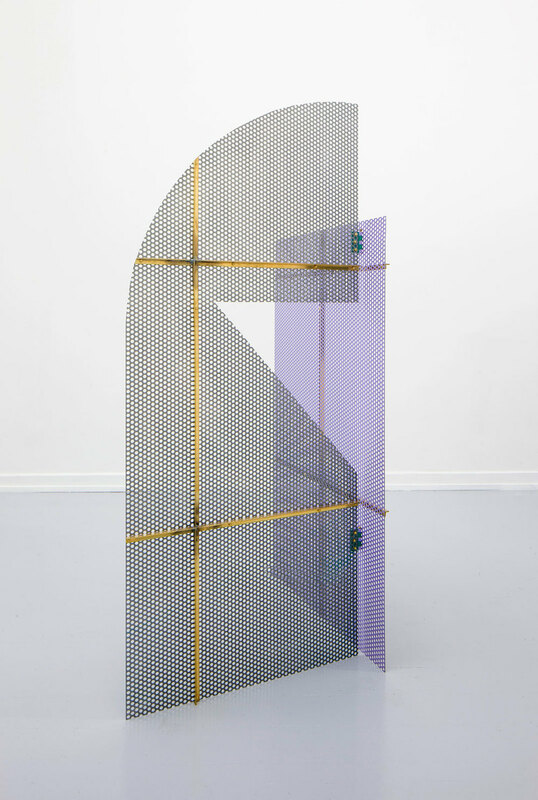 Berendes focuses on the physical aspect of paintings: her assemblages allow a 360 degree view, one might even reach out stroke over the steel surface of the framework. 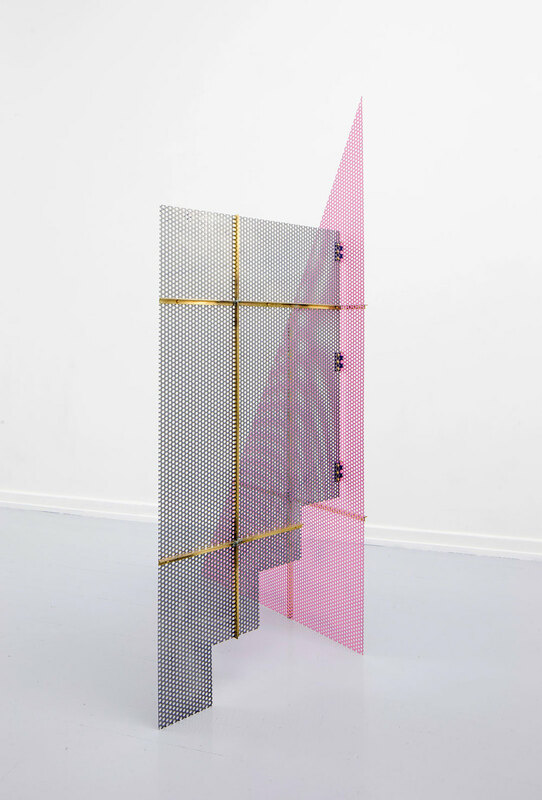 Eva Berendes reinterprets urban elements she comes across when she cycles through her home city Berlin and brings them together in her playful art series: perforated steel hand painted metal grid, umbrellas, a bike lock, tennis rackets. When we visited her in her workshop and her studio, Eva gave us an insight of her becoming an artist, the struggles and fears it brought along and the creative process behind her work. | Franziska | Please introduce yourself - If you just met a stranger in a bar from a different industry all together, how would you briefly explain to them what you do and who you are? | Eva | I studied Fine Arts, and started out with traditional still life paintings in oil on canvas. From there I developed my work gradually into more spatial constellations which make use of a variety of different materials. I started to draw inspiration from other fields – architecture, design and „the body“ for example. The figurative language I used in the beginning became more and more abstract. I still consider my work as paintings, even as still life's of sorts, as they still deal with some of the core ideas of painting – colour, composition, surface – though one might not immediately recognize them as such. | Franziska | How would you describe the outcome of your work process to someone who has no idea what your work looks like? | Eva | I work in different groups or series' of works that these days are mostly made of metal. My most recent series for example was inspired by elements and architectural features of the urban space: by playgrounds, fences, infrastructural items, etc., from which I singled out specific aspects to create pictorial arrangements. But my work comprises a larger spectrum of formats, ranging from small-scale white plaster reliefs – which are basic considerations with light and shadow – to room dividers and big curtains. These ladder objects often approximate objects that are commonly associated with design and decoration. They revolve around the question under which circumstances an object can be understood as a painting and the impact that this has on the way we approach it – as a painting, a craft item, or a quotidian product. | Franziska | Let’s go back to the beginning, at 13 could you have imagined where you would have ended up career wise? What did you want to do back then? | Eva | No (laughs). When I was four years old I wanted to either become a queen or a mother. I managed the latter one at least. I never knew what I wanted to be and never really wanted to know it either and I was annoyed that everyone wanted me to decide on it. At school we went to a career advisory one day and all of us pupils had to inquire about a profession. I asked how I could become a stage-designer, but the advisers had to pass on this one and said it was complicated. After finishing school, I was a bit lost, I was very motivated but only knew things I did not want to do. Although looking back this seems very naïve, I can still clearly remember why I did not want to study law or medicine. One day I stumbled into an art studio by coincidence (actually looking for something else) and was fascinated by it. I joined the class and started to paint on a daily basis. Together with a friend I also rented my own studio to be able to work outside the course and then applied for Fine Art academies. | Franziska | In retrospect do you think a university degree was necessary or worth the price for what you’re doing now? | Eva | Right, or they have relatives who do art. I recently spoke with a fashion designer who became a great artist. But it's pretty rare that someone takes the plunge from fashion for example, to art. | Franziska | Did you have any odd jobs while during your studies? | Eva | Nope, I had a tunnel vision, I spent my whole time in the studio and did not do much outside of that. Maybe a little bit of sport (laughs). I didn't go out a lot either. Everything I did, had to do with my work, like going to exhibitions...After I completed my studies in London I worked at commercial art galleries and learned a bit about the business – but I don't think that helped me much with what I am doing now. | Franziska | Was there any advice that you received that stuck with you and created an ‘AHA’ moment that influenced you as a creative, professional or influenced the next moves you made afterwards? | Eva | There are a few of course, but there is one specific piece of advice that comes to mind given by my professor in Berlin. He proposed me for a scholarship that was awarded by another professor from the same school. I was not chosen and I wanted to ask the jury-professor what the reasons were for that, as I thought I could learn something from it. But my own professor advised me not to approach her about it and to stick to advise from people who have shown interest in my work in the first place. I think he had a good point. Who knows what the reasons were for which she chose the student, and perhaps she would have rationalized her decision in a way that would have been a hindrance to me rather than a help. | Franziska | During their studies, a lot of design/art students and soon-to-be humanities scholars are struggling with the fear of later on not being able to live of what they have studied. Did you experience this fear? | Eva | Not really... or maybe a little bit. Ironically, the further I was away from living the life of a professional artist in economical terms, the more fearless I was. And the closer I got, in the moments when I sold a piece of work or two, the more I realized, that it is not that profitable, and that it's very difficult to live from this profession. Suddenly it's not this abstract, other life anymore, but it has become the reality of your tax returns... This is when I got scared the most (laughs), because then you realize: oh my God, this is so precarious. "Ironically, the further I was away from living the life of a professional artist in economical terms, the more fearless I was. And the closer I got, in the moments when I sold a piece of work or two, the more I realized, that it is not that profitable, and that it's very difficult to live from this profession." | Franziska | When you sold your first object, how did you know how much you can charge? | Eva | My first sale was on the occasion of the yearly exhibition at my academy and I just made up the prize. The first „professional“ sale was through a gallery and we priced it together beforehand. | Franziska | Being represented by a gallery is a good way for artists to provide themselves with an income. You are currently represented by 5 galleries. How did that happen? | Eva | That's different with different galleries. My first gallery was the one in Frankfurt, and the gallerist saw my work in a group exhibition, then visited my studio and invited me for my first show. My work sort of matched with her interests. The gallerists in London knew my work from my MA show at College and years later when they opened their gallery they contacted me. 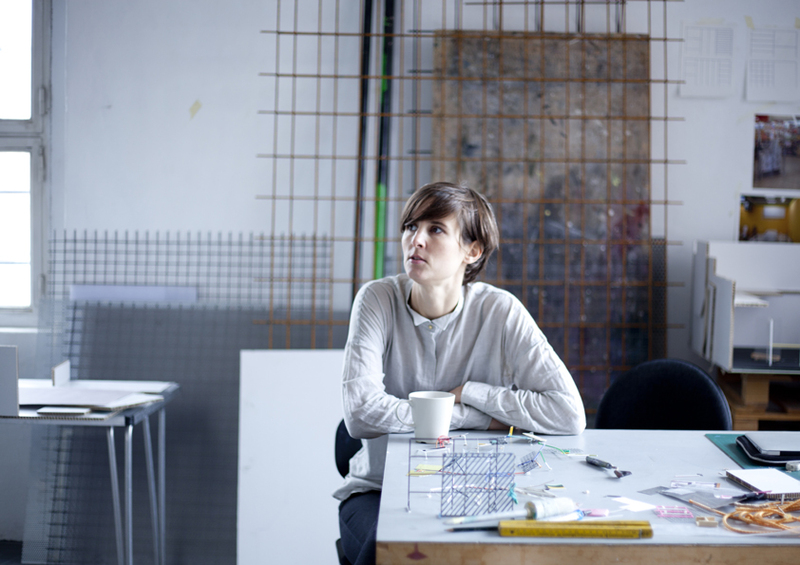 | Franziska | Any advice for young artists, who are trying to find a gallery? | Eva | Not sure, I guess, it is good to get in touch with the galleries whose program they like, but maybe not the ones who are already too established. I was never quite strategic enough about these things, but it somehow worked out fine for me. The big galleries, who operate on another level of power structures I suppose are advised by people they trust. That can be curators, visiting artists at the art academies or other people in the art world. Mostly it's about alliances between powerful people and institutions. Once an artist gets into these circuits this often produces a big career – which sometimes also end very fast. I think I could not have put up with an early, big career, especially not while I was still studying. I was not that secure in what I was doing. | Franziska | A lot of creative’s are blessed with their ideas and talent but don’t know where to start when it comes to the business, accounting and PR side of things. Was this hard for you when you went out on your own? | Eva| To me the question of with who I was going to work with seemed the most important. With some of the galleries I started from the beginning when they first opened. I was happy when they invited me to be part of their programme, but of course problems occurred and this is the hard part, because most things are not outspoken or agreed on. So what are the rules of the collaboration? And how do you react if your gallery does not get back to you for two weeks in an urgent matter? These issues have been difficult, and they still are. And sometimes I still wonder what is better – to relax and trust that everything is going to be fine or to take a very clear stance. But this also applies to other parts of my life. When do I say no to an invitation? Should I do something out of kindness? Is it good to be part of everything? Some artist only work on projects they are 100 percent convinced of, others simply do everything. Some become very successful because they only do the best of the best and it works out and others at some point regret being so selective because all of a sudden they drop out of that and then don't have a solidarity network. You somehow have to find your way through these things. | Franziska | A lot of artists are sensitive to guidelines and pressure of production and still refer to the idea of autonomy, which originates from the avant garde. What do you think of contract work? | Franziska | Which one is your favorite project that you’ve done and why? | Eva | Mostly my favourites are my latest works. I still like most of the older ones, too, but naturally they have aged and at some point I start considering them as a step to what I am doing now. They are already carried out, worked through, completed. | Franziska | What would you answer if an exhibition visitor approached you, saying: looks nice but I don't understand what this is supposed to tell me. | Eva | I would find this question a little bit lazy, and would try to get away from the conversation with a lame excuse. I think I already offer a lot of information with the work. And if someone asks me a particular question, for example about my choice of material, the method of construction, or about reference XY, I am happy to answer. But if I am asked why I am doing this altogether, I simply lose interest. I want people to take a look first. I don't teach contemporary art. 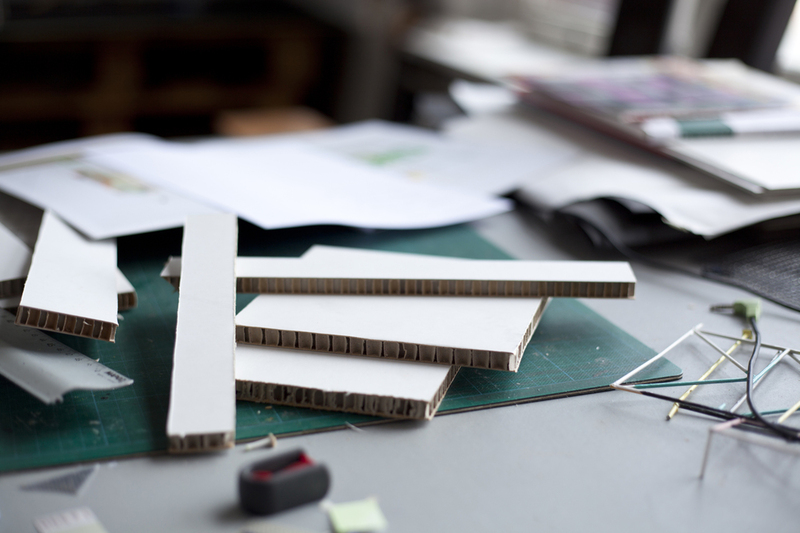 You can make an effort and notice decisions I made and based on that you can ask me what a certain thing like for example handicraft means to me, or whether a time-consuming execution technique is about a meditative moment, or not. 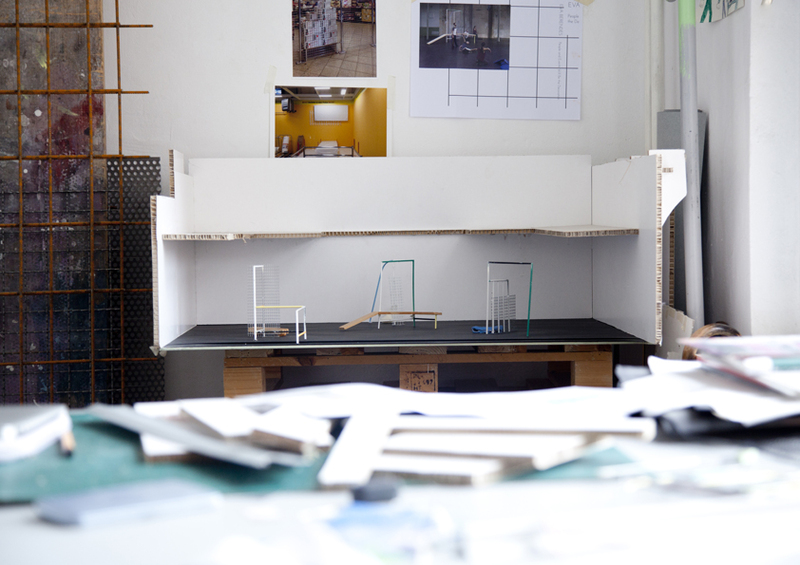 | Franziska | Could you give us an insight in the creative process behind this very piece of work here in the studio? | Eva | I recently read an interview between two artists who talked about the question whether beginning or finishing a piece of art is the most difficult part. For me, the beginning is definitely the most difficult. This is mainly because I don't have a routine in that as I keep changing my format and medium. So I need find my parameters anew every time. 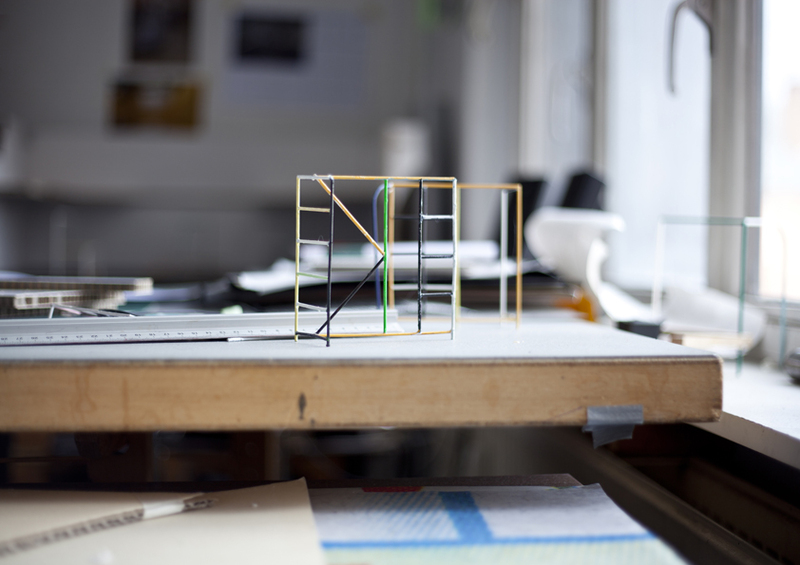 The development of that takes a long time: making models, taking pictures, selecting materials to experiment with, trying out different arrangements... But once I have all my ingredients, the work starts to fall into place. | Franziska | What do you have in the pipeline now? | Eva | In 2016 I will continue a collaboration with the choreographer Sebastian Matthias. I built a dance stage set for one of his performances last year, that was traveling through several dance venues in Europe. This time we are going to work in the public space and I will build sculptures that dancers and passers-by will interact with. For later in the year I am working on a solo exhibition that brings together older and new work and an accompanying catalogue. CK Coffee is good on Marienburger Str. Best co-work space in Berlin? Best place to get a drink in Berlin? Hotel you would stay in if you weren’t from Berlin? Best place to take clients in Berlin?